John Selker, professor of biological and ecological engineering and Chris Parrish, associate professor of geomatics and Eric H.I. and Janice Hoffman Faculty Scholar at the seafloor instrumentation workshop in July 2018. Sponsored by the National Science Foundation, Oregon State hosted a seafloor instrumentation workshop, “Integrating Science Needs with Advanced Seafloor Sensor Engineering to Provide Early Warning of Geohazards: Visioning Workshop and Roadmap for the Future,” which integrated the expertise of leading scientists and engineers to advance seafloor sensor development and widespread deployment. 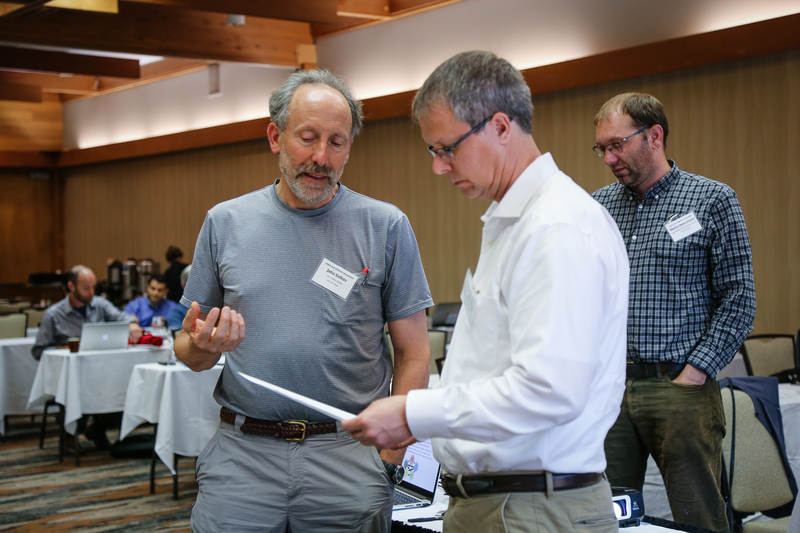 Integrating autonomous marine vehicles, computer science, geotechnical engineering, marine geomatics, robotics, and more, the two-day workshop charted the future for instrumenting the seafloor to provide real-time data. One key focus was to develop strategies to enable early warning of geohazards. Participants explored the development of sensors to measure seafloor deformation, temperature, and fluid flow with high resolution over broad areas, strategies for transmitting the data to land quickly and efficiently, and methods for obtaining energy from the environment.